The goal was noble. 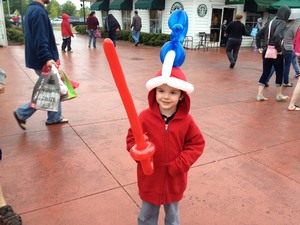 I wanted to give my kids the experiences I cherished most from my childhood. Those moments always centered around camping and RVs and the kind of family time you don’t get from sitting at home. I have been dreaming about it for a quarter of a century now. My mission and my resolve was cemented further over the last couple years by Tom Selleck’s “Go RVing” commercials. Tom, you had me at “Away.” The exec who got Selleck and greenlighted the copy is a genius. Tears well up every time I see these commercials. I mentioned my pursuit in my column about my family's I-95 Thanksgiving debacle. I want to show my kids that there’s more than Xbox and iPads for fun, that adventure is the best app out there. 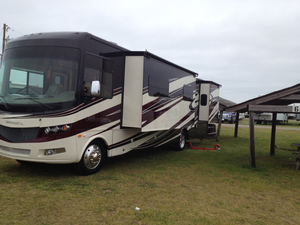 After 25 years of dreaming about it, I was finally able to make my RV dream a reality. Debbie, my wife of 18 years and the one person who has endured all my hair-brain schemes, get-rich plans and “savings” opportunities, signed off on the purchase. So we went to Boat N’ RV Megastore in Ridgeland, S.C. Soon, the salesman had us into an affordable 1998 Bounder with only 40,000 miles in it. Sadly, the minute we left the lot, the dream turned into a six-month long nightmare. Bounders have an impeccable reputation and a fan club onlineThis Bounder was lacking turning radius. I found this out when I tried to maneuver around a stanchion pole trying to exit the storage facility for our first trip. A pop-up trailer was parked where it wasn’t supposed to be. Still, I thought I could make the turn. Not so much. 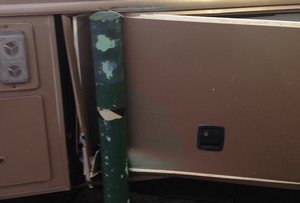 We drove the Bounder back to Boat N’ RV, where they told us they couldn’t replace that storage door. As revered as the brand was, the company that manufactured it went out of business and so replacing the door was going to be next to impossible. A new door would need to be fabricated – a four-month job. 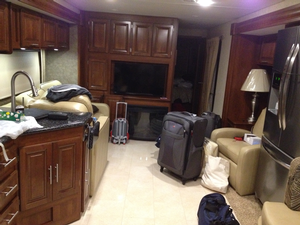 So they offered to trade us out of the RV. Given the four-month-at-best replacement window, we traded up to a 2006 Sportcoach. Now, this was a $260,000 investment, and we got a great deal on it. Sadly, the RV lived in Pennsylvania before coming south and the owner never winterized it. So, salt from harsh winters created problems. While the interior was gorgeous, the exterior was a money pit of hidden nightmares. We tried to take delivery on it four times. 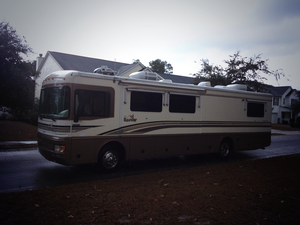 The jacks weren’t retracting, the fridge compressor was busted … you name the problem, this RV had it. The fourth time I tried to take it home, my dad was in town. So proud son was going to show off and let him see how much those weekends at the campground meant to me. We got 10 miles up the highway before coolant fluid started gushing out of the exhaust pipe – the result of a corroded clamp, as we later found out. Dash alarm lights flashed as my dad – following behind in my truck – signaled me to pull over. All of a sudden, I couldn’t get over 20 mph. The engine went into self-protect mode. But dammit, I wasn't getting towed. I glided and thankfully made it home. We were done with other people’s problems. We traded into a 2014 Georgetown XL by Forest River. It’s Warren Buffett’s company, so it’s not going away any time soon. Plus, every salesperson in the place dropped the “it’s the No. 1 selling Class A” line on us. Message received. 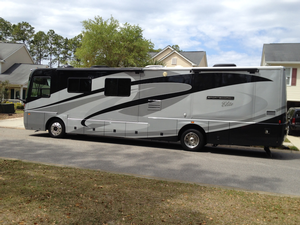 We picked it up Wednesday and immediately headed for Myrtle Beach. And I’m happy to report that third time was a charm. All the moments I dreamed of giving my kids, it was all there. Tom Selleck wouldn’t lie. 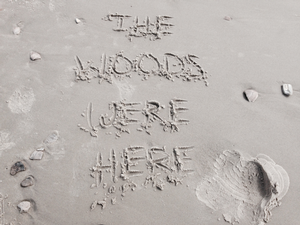 Our campsite was steps from the ocean. We paid the same for four nights at Pirateland Family Camping Resort that we’d pay one night at a decent hotel. The weather kept away the campfire and the marshmallows, but there’s plenty more trips for that to happen. We taught the kids how to play bocce, we collected seashells galore and still retreated at night to a luxury rolling hotel – complete with a recliner, fully-equipped kitchen and yes, a 40-inch home theater TV that connected to my son’s XBox. 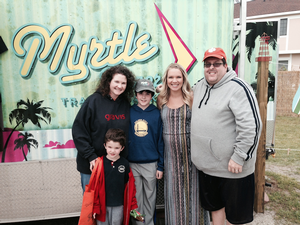 And as an added bonus, we searched out Myrtle Manor, the trailer park at the heart of our favorite reality show, “Welcome to Myrtle Manor.” The stars like Chelsey (pictured below) weren’t actors, they live at the trailer park and couldn’t have been nicer to us. Throw in some mini-golf and a day at the Broadway at the Beach complex -- where Jake got a stylish balloon hat -- and it was an action packed four days. We’ll definitely be back to Myrtle Beach, but there’s endless adventures waiting out there. Flamingo Lake in Jacksonville is next. Maybe a NASCAR race after that. My boss heard I was getting this and said, “Good luck on the Redneck Riviera.” It’s not his thing and I know it’s not for everyone. More and more, travel agents are embracing the rental possibilities and companies like Airstream2Go are helping. It’s a completely untapped travel agent segment to date, but that’s changing. I plan on using this space to preach the gospel of the Redneck Riviera. We’ll see the Southeast and the entire country, one getaway at a time. I know there are cheaper ways to get away. But this was the dream. Thankfully, once the nightmare passed, the dream is still plenty alive. We can all be Tom Selleck. It’s as easy as getting away.